A concise narrative of Greek history and an analysis of the literature, art, and thought of the ancient Greeks. David Sansone is Professor of Classics at the University of Illinois, Urbana-Champaign. He has published extensively on Greek language and literature, including literary and textual criticism of Greek tragedy and Plutarch’s Lives and a theoretical study of the origin of sport. He has been on the Board of Directors of the American Philological Association and held a number of editorial positions, among them the editorship of Illinois Classical Studies and membership of the editorial boards of Classical Philology and Bryn Mawr Classical Review. 1. Greece in the Bronze Age. 3. The Poems of Hesiod and Homer. 4. Poetry and Sculpture of the Archaic Period. 5. Symposia, Seals, and Ceramics in the Archaic Period. 6. The Birth of Philosophy and the Persian Wars. 7. Setting the Stage for Democracy. 8. History and Tragedy in the Fifth Century BC. 9. The Peloponnesian War: A Tale of Thucydides. 10. Stage and Lawcourt in Late Fifth-Century BC Athens. 11. The Transformation of the Greek World in the Fourth Century BC. 12. Greek Culture in the Hellenistic Period. Updated edition includes additional illustrations, maps, and timelines, a glossary, and an annotated bibliography. "Sansone’s book admirably fills the need for a succinct, readable, and reliable survey of ancient Greek civilization. The first edition was perfect for my Classical Civilization course - the second edition offers even more while maintaining the accessibility of the original." 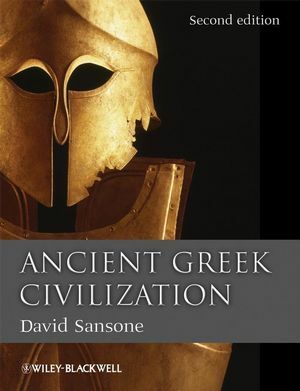 "In this book David Sansone brilliantly analyzes the strands of history, literature, art, and culture which combine to form the tapestry of Ancient Greece."